Despite what was agreed to be the worst weather experienced in the event's 38-year history, over 90 bikes rode into Norrtälje's Societetsparken to compete across 8 classes at the Custom Bike Show, organised by Twin Club. Winner of the Custom class and selected by the jury as Scandinavian Champion, privateer Claes Wärefors will travel to Sturgis to compete in the this year's 9th annual AMD World Championship of Custom Bike Building. 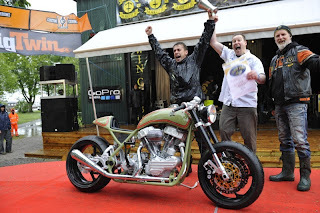 The winning bike, "Gryphon", was built by Claes in conjunction with Kegny Karlsson of KDK Performance, Kungsör, Sweden, who built the one-off frame, front end, swingarm, seat pan, gas and oil tanks. The engine is a modified 88cui Harley-Davidson 1967 early Shovelhead and features Truett & Osborn flywheels with 4-3/4 stroke and S&S heavy duty rods, JIMS Power Glide hydraulic lifters, lifter blocks modified by Mectec, Sifton Avenger camshaft and S&S billet oil pump and gearcase cover. The top end features STD Panhead with double plugs modified by Swedish specialists Mectec, S&S forged stroker pistons, S&S valve springs and collars, and aluminum covers by Robbans Speedshop in Sweden. The Scandinavian Championship runners-up were also privateers, Samuli Kaiuola from Finland and Per-Olof Josefsson from Sweden winning expenses to travel to Germany for the 2013 10th annual AMD World Championship to be held on May 10-12.